To learn more about Apache Spark, attend Spark Summit East in New York in Feb 2016. Developers have always loved Apache Spark for providing APIs that are simple yet powerful, a combination of traits that makes complex analysis possible with minimal programmer effort. At Databricks, we have continued to push Spark’s usability and performance envelope through the introduction of DataFrames and Spark SQL. These are high-level APIs for working with structured data (e.g. database tables, JSON files), which let Spark automatically optimize both storage and computation. Behind these APIs, the Catalyst optimizer and Tungsten execution engine optimize applications in ways that were not possible with Spark’s object-oriented (RDD) API, such as operating on data in a raw binary form. Today we’re excited to announce Spark Datasets, an extension of the DataFrame API that provides a type-safe, object-oriented programming interface. Spark 1.6 includes an API preview of Datasets, and they will be a development focus for the next several versions of Spark. Like DataFrames, Datasets take advantage of Spark’s Catalyst optimizer by exposing expressions and data fields to a query planner. Datasets also leverage Tungsten’s fast in-memory encoding. Datasets extend these benefits with compile-time type safety – meaning production applications can be checked for errors before they are run. They also allow direct operations over user-defined classes. In the long run, we expect Datasets to become a powerful way to write more efficient Spark applications. We have designed them to work alongside the existing RDD API, but improve efficiency when data can be represented in a structured form. Spark 1.6 offers the first glimpse at Datasets, and we expect to improve them in future releases. A Dataset is a strongly-typed, immutable collection of objects that are mapped to a relational schema. At the core of the Dataset API is a new concept called an encoder, which is responsible for converting between JVM objects and tabular representation. The tabular representation is stored using Spark’s internal Tungsten binary format, allowing for operations on serialized data and improved memory utilization. Spark 1.6 comes with support for automatically generating encoders for a wide variety of types, including primitive types (e.g. String, Integer, Long), Scala case classes, and Java Beans. Both APIs make it easy to express the transformation using lambda functions. The compiler and your IDE understand the types being used, and can provide helpful tips and error messages while you construct your data pipeline. Since the Dataset version of word count can take advantage of the built-in aggregate count, this computation can not only be expressed with less code, but it will also execute significantly faster. As you can see in the graph below, the Dataset implementation runs much faster than the naive RDD implementation. In contrast, getting the same performance using RDDs would require users to manually consider how to express the computation in a way that parallelizes optimally. Another benefit of this new Dataset API is the reduction in memory usage. Since Spark understands the structure of data in Datasets, it can create a more optimal layout in memory when caching Datasets. In the following example, we compare caching several million strings in memory using Datasets as opposed to RDDs. In both cases, caching data can lead to significant performance improvements for subsequent queries. However, since Dataset encoders provide more information to Spark about the data being stored, the cached representation can be optimized to use 4.5x less space. To help you get started, we’ve put together some example notebooks: Working with Classes, Word Count. Encoders are highly optimized and use runtime code generation to build custom bytecode for serialization and deserialization. As a result, they can operate significantly faster than Java or Kryo serialization. In addition to speed, the resulting serialized size of encoded data can also be significantly smaller (up to 2x), reducing the cost of network transfers. Furthermore, the serialized data is already in the Tungsten binary format, which means that many operations can be done in-place, without needing to materialize an object at all. Spark has built-in support for automatically generating encoders for primitive types (e.g. String, Integer, Long), Scala case classes, and Java Beans. We plan to open up this functionality and allow efficient serialization of custom types in a future release. The power of encoders goes beyond performance. They also serve as a powerful bridge between semi-structured formats (e.g. JSON) and type-safe languages like Java and Scala. Instead of manually extracting fields and casting them to the desired type, you can simply define a class with the expected structure and map the input data to it. Columns are automatically lined up by name, and the types are preserved. Encoders eagerly check that your data matches the expected schema, providing helpful error messages before you attempt to incorrectly process TBs of data. For example, if we try to use a datatype that is too small, such that conversion to an object would result in truncation (i.e. numStudents is larger than a byte, which holds a maximum value of 255) the Analyzer will emit an AnalysisException. When performing the mapping, encoders will automatically handle complex types, including nested classes, arrays, and maps. While Datasets are a new API, we have made them interoperate easily with RDDs and existing Spark programs. Simply calling the rdd() method on a Dataset will give an RDD. In the long run, we hope that Datasets can become a common way to work with structured data, and we may converge the APIs even further. Performance optimizations – In many cases, the current implementation of the Dataset API does not yet leverage the additional information it has and can be slower than RDDs. Over the next several releases, we will be working on improving the performance of this new API. Custom encoders – while we currently autogenerate encoders for a wide variety of types, we’d like to open up an API for custom objects. Unification of DataFrames with Datasets – due to compatibility guarantees, DataFrames and Datasets currently cannot share a common parent class. With Spark 2.0, we will be able to unify these abstractions with minor changes to the API, making it easy to build libraries that work with both. If you’d like to try out Datasets yourself, they are already available in Databricks. We’ve put together a few example notebooks for you to try out: Working with Classes, Word Count. 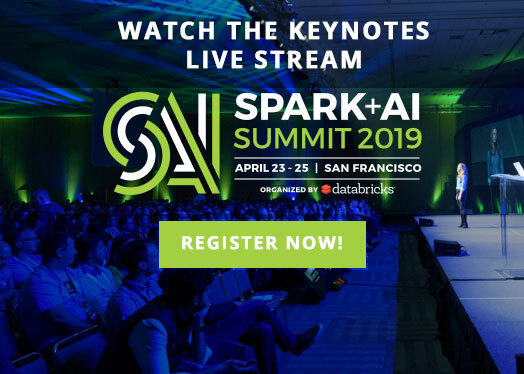 Spark 1.6 is available on Databricks today, sign up for a free 14-day trial.